Just over a year ago an article about my APRS experiments with the International Space Station appeared in the zeroth issue of the print magazine. Since then a lot happened and I got some nice QSOs into my log that way. Unfortunately the transceiver that had been used as the digipeater on the ISS stopped working in late summer 2016. Because of that, no APRS operation via the ISS has been possible at all. However, some weeks later a temporary solution in the 70 cm band had been established and the experiments with the ISS could continue. APRS via ISS is more complex on the 70 cm band. The doppler effect needs to be compensated both on the transmitting and receiving side. Presumably because of the higher effort needed, less operation was going on via the 70 cm digipeater. In spring 2017 the defective 2 m transceiver could be replaced. The message spread quickly and within hours the digipeater has been well-attended and used again. I’ve got lots of feedback for my article at that time and provably made many radio amateurs curiously about the topic. Even today many enquiries reach me and I’m being questioned for tips and hints for operating. Reason enough to pick up that thrilling topic again. That is the question most often asked. The simple answer: Try the antenna you already have. I’ve heard reports of radio amateurs who could place their beacons via ISS using a rubber duck antenna. So isn’t it a good idea, to simply get started? However, you shouldn’t linger over that and use better antennas after a short time. When I’m operating using hand-held equipment, I’m still using the Diamond RH-770 telescopic antenna I mentioned in the article back then. I’m using the Diamond NR-770H antenna, when I’m in the car. Both antennas have a flat radiation pattern and thus a useful radiation. But also the window clamp antennas made by JWX can be used as well. Of course, you will get a higher gain using directional antennas. But also using a log-periodic or small Yagi antenna the ISS can be worked. Though the disadvantage is that a directional antenna needs to be pointed correctly, to get it working. If you’re getting less than 4 watts out of your handheld transceiver, you should begin using a directional antenna. Modern handheld transceivers output typically around 5 watts. This is – in combination with a decent antenna absolutely sufficient, to be heard by the ISS. Taner Schenker, DB1NTO even has been able to transmit a beacon via the ISS using the PicoAPRS. This small device only provides 1 watt of output power, but combined with a small Yagi antenna, that’s sufficient. I have been trying to send beacons to the ISS from many places, I almost always succeeded. A nonobstructed line of sight to the flight path is important. I have even had success in narrow street canyons, but then the ISS is only usable for a short period. If you don’t have a good sight, you should look out for pass as highly elevated as possible. The highest elevation should then be between 70° and 90°. An antenna with a flat radiation pattern on a car roof would be at a disadvantage, but it is still working. I disregard all passes below an elevation of 20° because of my region and my moderate antenna sites. Therefore, all passes above 20° are interesting for me. At my place in JO62 that usually means two to three passes, with a duration of five to six minutes, daily. How do I find suitable passes? Suitable passes can be found easiest using satellite tracking sotware respectively apps. I’m preferably using ISS detector out of habit on my smartphone, as mentioned in the article back then. It displays all passes of the ISS in the free version. If you want to display passes of NO-84 or other amateur radio satellites, you’ll need the pro version or you need to trigger an in-app purchase. Alternatively, you can also use the cost-free AMSATdroid FREE app. A programme, I like to use on my computer, is Orbitron. Although Orbitron has been developed for Windows, it’s also running on Linux using emulation by Wine. But with Gpredict there’s also a platform independet open source tool for tracking satellites available. It is running on Windows, Linux and on Mac OS. For iOS Satellite Explorer Pro is the software of choice. Nothing received – What could be the cause? By the time the digipeater is active, you should be virtually always able to receive the ISS. But once in a while the digipeater isn’t active. During maintenance of the ISS, docking maneuvers or other extraverhicular activities, the digipeater is switched off. The digipeater also can’t be used during scheduled school contacts or during transmissions in SSTV . The reason can often be found through some research via active AMSAT operators. Is the digipeater even active? If the digipeater is active at all, can be determined using the website ariss.net. The following screenshot show us, as an example, that the call sign RS0ISS had been heard 1h and 18 minutes ago by a SAT-gate and that the data has been forwarded to APRS-IS. Furthermore, we can see that some stations in australia and the USA have been heard recently. On ariss.net can only be packets of the ISS found. Information about the acitivity of other satellites like e.g. NO-84 (PSAT) can be found on pcsat.findu.com. There, the identifiers PSAT and PSAT-1 are of interest. Whenever the identifier PSAT-1 is transmitted, the digipeater is deactivated. This is the case most of the time. So, if you receive telemetry sent by PSAT-1, you don’t have to try transmitting. Both websites mentioned are important sources regarding the activity recently. There you will find your call sign, if your transmission is heard by a SAT-Gate. If you want to know when NO-84’s digipeater becomes active again, you should have a look at the blog of Mike Rupprecht (DK3WN). There you will hints from time to time, if the digipeater becomes activated again. How long the digipeater on NO-84 stays active, depends on the battery level. Whenever the voltage drops below a specific point, the satellite resets and therefore deactivates the satellite’s digitpeater. How often should I transmit postion beacons? To be able to answer that question, one should keep in mind, that a simplex frequency is being used for both up and downlink. The Highlander rule applies. There can only be one who uses the frequency simultaneously with success. Furthermore applies, that only the stronger signal will be heard. So, if you transmit non-stop using 50 watts output power and automatic tracking and send packets every second, you won’t leave any other station with equipment not as good as yours no chance. If you’re using a handheld transceiver, you can absolutely transmit position beacons every twenty to thirty seconds. I transmit beacons manually and try to get a time slot between the others. Fixed stations utilising more power and better antennas shouldn’t transmit beacons more often than once a minute. Personal messages to other radio amateurs can be send more often, if needed. It is important to have consideration to leave other operators a chance to do the same. How does a QSO go in APRS? According to Bruce Paige (KK5DO) that’s enough for a complete QSO, in his view an exchange of rapports and locators isn’t needed. This man has been AMSAT-NA director and has been in charge for contests and awards. Nethertheless, the RST rapport and locator are often exchanged in addition to the call sign. The meaningfulness of a rapport is controversial, out of various reasons. To get a single position beacon to the ISS is a piece of cake. However, if you want to make QSOs via ISS or PSAT, you will assess that this isn’t that easy. Both stations need to have the ISS, respectively the satellite, in range at the same time. Besides that, both stations need the correct timing for transmit and receive. You receive a lot of position beacons of others stations on a pass. Theoretically, there could be a QSO partner behind every station and you could send them all a message and wait for an answer. In practice, this procedure hasn’t proved to be successful. I therefore handle it different. 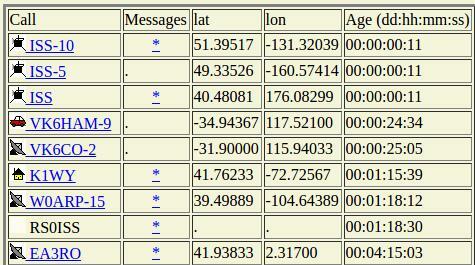 I always look at the raw data on ariss.net and look for call signs of stations that send personal messages to other stations. I also do that in case I don’t have time to operate myself. I just want to get a personal list of active operators. Stations that only crank always the same meaningless beacons aren’t contacted by me, but as soon as I get the impression that there is someone who is really interested in having QSOs, I try to contact them. If you do that for a while, you know who’s operating at a keyboard and who’s transmitting beacons unmanned. Of course, it’s easiest via a sked. You agree onto a pass that fits both stations beforehand and then you concentrate on making a complete QSO. By means of that method I have already been able to get some QSOs into the log. Many active radio amateurs can be found on facebook or twitter. These platforms work well to arrange skeds and to exchange experience. Novices searching someone for the first QSO via ISS are in good hands in the facebook group „APRS via ISS & Satellit” (german, remark by the translator). Location with undisturbed view to the sky? Pass with an elevation of more than 30° in the next few minutes? Equipment is sufficietly tested? Terrestial packets have been received? Squelch on the receiver is open? Volume regulator is attuned for the TNC? If you can receive other stations, try to transmit yourself. Basically every APRS client that can send messages works. Many operators swear by UISS, because it has many useful functions. Besides that, it can be used with any given TNC or sound modem. For a fixed station, I’d recommend UISS and Direwolf. Since I almost only operate portable, I prefer to use APRSdroid on my mobile phone. Basically every working 2m FM handheld transceiver is suitable. A simple handheld transceiver or old professional mobile radios (PMR) in combination with a TNC or sound modem is well suited. 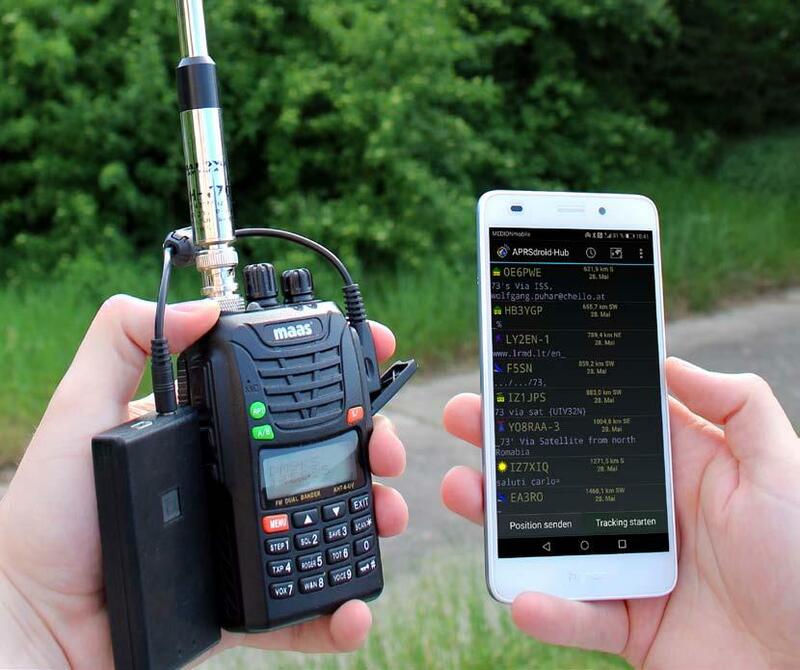 If you don’t want to use a computer or a smartphone to send messages, handheld transceivers with integrated APRS can be another option. If you’re going to acquire a new radio, you should look for functions that simplify the later operation. Automatic answers to incoming messages on Keenwood-radios have proved helpful. A storage facility for predefined messages is a great convenience, if you want to send a message fast. You should visit ariss.net or pcsat.findu.com after the pass and check if you have been heard. If your try via the ISS has been successful, you should print out the raw data or make screenshots, if you want to get a QSL card of RS0ISS. You can look up how to apply for a QSL card on the blog of DK9JC (german, remark by the translator), by the way. If your try hasn’t been successful, try it again and tweak your setup. Very useful advice. Thanks silvio. I used an old 137mhz weather satellite turnstile antenna unmodified for my first aprs vis iss yesterday . It gives great coverage for high elevation passes and no need to rotate it!! .